Rescuers have been called out to save the same man in Snowdonia three times in a matter of weeks. Llanberis Mountain Rescue team was first asked to find the 46-year-old in October, then again in December, and once more last Friday. North Wales Police said the man was arrested on Friday but later released without charge. John Bushell, of the Vivian Diving Centre in Llanberis, said he was worried about the safety of rescuers. "This man is putting both his life and other people's lives at risk by calling the emergency services like this," said Mr Bushell. "In addition it must have cost thousands of pounds to get these teams out," he added. Ian Henderson, secretary of the Llanberis Mountain Rescue team, confirmed the three rescues, including the latest on Friday, when 23 team members were involved. Police said the man called the emergency services at 1652 GMT. The search was called off at 2025, although he had not been found at that stage. He was eventually arrested at 2340 GMT on suspicion of causing a public nuisance, but was later released without charge. 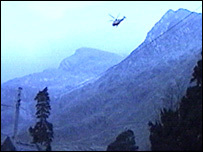 On 1 December the man was traced when rescuers listened to the background noise of the helicopter travelling back and forth along the mountainside to pinpoint his location. Nineteen members of the team took part in that search, as well as two RAF personnel and three search dogs on the foothills of Snowdon. The January issue of the North Wales Police newsletter Y Glas features a warning that using 999 for non-urgent calls puts lives at risk. It adds that since April last year, 20 phones have been disconnected and 22 fixed penalties issued to people who constantly misuse the system. "You should dial 999 in a life or death situation, if you fear for someone's physical well-being or if property is being damaged," it adds. The two non-emergency numbers are 0845 607 1002 (English language line) 0845 607 1001 (Welsh language).